With over 8 years of professional marketing experience, Kim felt ready to take the next step, moved to London and started her course last January, after being impressed with LSBU's teaching staff, facilities and the quality of courses on offer. As an ambitious professional, it was important to Kim that she didn't take her foot off the pedal in her career, and she also needed to be able to finance her study. After researching 'a lot' of universities and attending an open day, she chose a part-time MSc International Marketing course at LSBU that allowed her to balance a degree and her professional life. "It's challenging, but it means I can directly apply my learning and continue to earn," she explains, " but it's also a lot more fun than I expected!" I have the freedom to learn and earn; and that's really important to me. Kim knows the teaching at LSBU is really helping to boost her career. Whilst studying her degree, she has landed an international marketing role working for UK Trade and Investment, promoting UK businesses overseas. Using the knowledge she is learning on a day-to-day basis, she is responsible for marketing strategy to promote trade events. "The standard of the lectures and seminars is very high – you have confidence that what you are being taught is innovative and industry relevant." 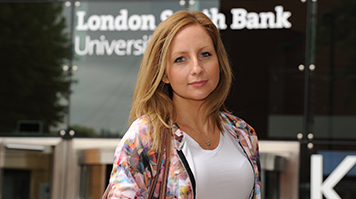 Kim has certainly broadened her horizons and increased her aspirations since studying at LSBU. An international career beckons and Kim hopes to work in both the European and Asian-Pacific markets, but most importantly to her, she wants to really feel passionate about her work. "I simply want to make a real difference in the world. This may be through running my own business or creating and sharing something new but whatever I do, I want to challenge the norm and constantly challenge myself too. I feel that my course at LSBU has equipped me with the tools to achieve future success, so now it's up to me!"